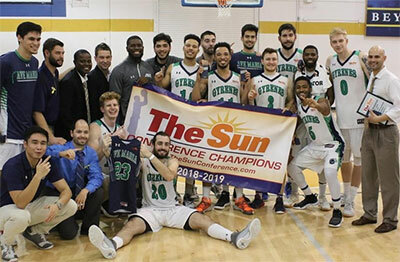 There was something special in the air at the Turner Athletic Center in Lake Wales, as the Ave Maria University men's basketball team won the 2019 Sun Conference Tournament with an 83-67 victory over the College of Coastal Georgia Mariners on Saturday night. The Gyrenes will play for the first time ever in the NAIA Division II Men's Basketball National Championship in Sioux Falls, South Dakota. Ave Maria led from start to finish on Saturday night, never looking back after scoring the first six points of the game. A scrappy Coastal Georgia team that won back-to-back road games to reach the conference title game did not allow the Gyrenes to pull away, keeping AMU within single digits throughout the first half. Ave Maria closed the first half on a 5-1 run to extend their lead to seven points, 37-30, after the first 20 minutes of play. With another raucous Ave Maria crowd on hand, the Gyrenes began to pull away from the Mariners in the second half. The lead grew as large as 19 points in the second frame, with each Ave Maria basket greeted by a near-deafening roar from the AMU faithful. As the clock ticked down to all zeros, the Gyrene crowd stormed the floor at Warner University, celebrating the program's greatest accomplishment to date. The celebration included the traditional cutting down of the nets, as the Gyrenes climbed the ladder to acquire their keepsake. Three Gyrenes led the way to secure Ave Maria's conference championship, as Leo Behrend (6'4''-G), Romello Bates (6'0''-PG), and Caelen Watts (6'1''-G) combined for 71 points. Bates scored 25 points and dished out seven assists, while Behrend pulled down 15 rebounds to go with his 25 points. Watts made eight of his eleven shots en route to a 21-point performance, and he also grabbed six rebounds. Following the contest, Bates was honored by the conference as the 2019 Sun Conference Tournament Most Valuable Player. Behrend joined Bates on the All-Tournament team, which was rounded out by Coastal Georgia's Jaylen Smallwood (6'2''-F), Southeastern's Jeremy Oppenheimer (6'2''-G), and Warner's Bart Schild (6'7''-F-97). F: Joshua Scott (6'7''-F) of Thomas Univ. G/F: Tommie Luke (6'3''-G/F) of Webber Intern. F: Cedric Wright (6'7''-F) of Thomas Univ. C: Dante DiSipio (6'9''-C) of Thomas Univ.